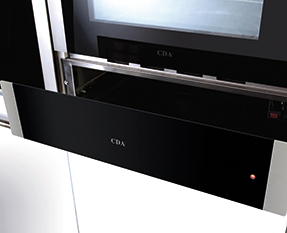 The CDA VW142SS 14cm warming drawer is the perfect partner for a CDA oven, coffee machine or a compact combination microwave oven. The appliance lets you heat to the right temperature, or keep food warm and ready for serving. 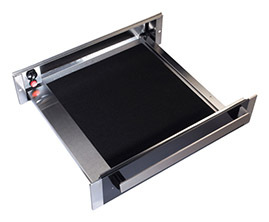 Warming drawers have the capability to do much more than get plates ready for serving food. Use a warming drawer to create ‘sun-dried’ tomatoes at home or even create homemade yoghurt that is healthy for the whole family. Once you have explored the capabilities you will want one in your kitchen right now! Warming drawers look great when installed beneath a compact or 60cm built-in single oven. They add practical function to the kitchen and allow compact models to be perfectly aligned with larger, 60cm models. Choose between the standard or large sizes, depending on what you intend to use yours for and how much you need to fit inside. There are also handled and handle-less designs to choose from that give you the option of creating a coordinated or a streamlined look to your kitchen. All of the models in the range are thermostatically controlled, with heat indication lights for safety. This will ensure safety with the absence of a control panel. The range starts with slimline warming drawer models that feature a brushed steel trim and ergonomically designed steel handles to match. They slide out on smooth runners and feature a non-slip mat to prevent plates from sliding about. This size is also available with a handle-less design that utilises a ‘push-push’ action to operate. You wouldn’t even know that the drawer was a drawer, until you opened it. If you are after something larger, the VW281 can fit much more inside and keep much larger meals warm until you are ready to serve. The range also includes a built-in grill drawer that adds separate, controllable and convenient closed door grilling, installed into your bank or wall unit. You can set the temperature and grill food with the drawer shut for an easy to use solution that doesn’t take up the whole use of your oven during busy cooking times. Built here in Nottinghamshire, the grill drawer is our unique design and is perfect for indoor grilling kebabs, vegetable skewers, bacon, toasting bagels and, of course, sausages. Did you know that there are so many things that you can do with a warming drawer? Aside from preheating plates for serving and warming servings dishes so that they keep food piping hot for serving, you can cook with them too! A warming drawer will make homemade yoghurt with some fresh whole milk and a live culture starter, or even ‘oven-dried’ tomatoes by slowly drawing all the moisture from sweet and tasty seasonal fruit. You could make tooth-friendly, homemade ‘fruit roll-ups or leathers’ for the family lunchboxes by slow drying out a fruit paste on a baking tray in the warming drawer. Not to mention the golden usage of the warming drawer: to prove bread and yeast doughs. Forget leaving bowls of pizza dough, loaves and yeast pastries in a warm place to rise, which is often inconvenient and sometimes unhygienic, now you can prove your dough in a controllable environment that is away from germs. Once you have tried a warming drawer, you will always look for it to help you out in the kitchen.